Citation FICUS BENJAMINA Linnaeus, Mant. Pl. 129. 1767. Type: INDIA: Without data (lectotype: Rheede, Hort. Malab. 1: t. 26. 1678. 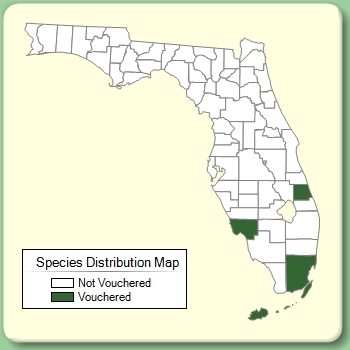 Lectotypified by A. C. Smith, Fl. Vit. Nova 2: 175. 1981. 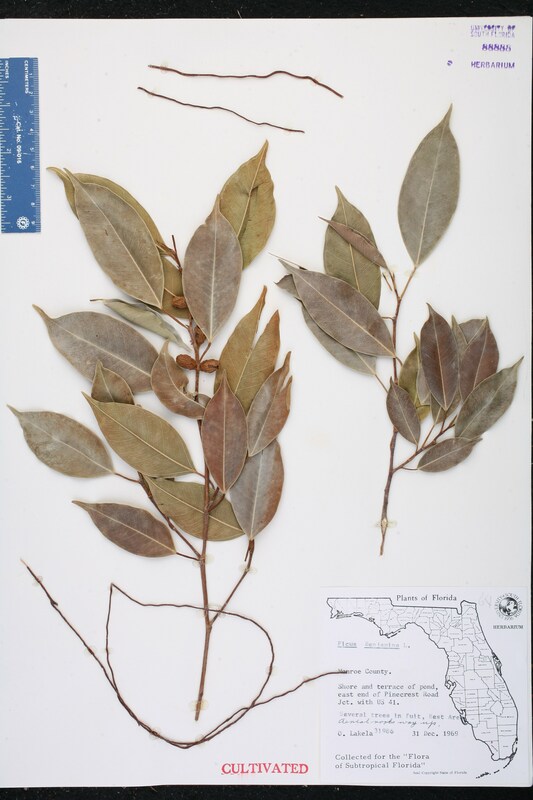 Ficus pyrifolia Ficus pyrifolia Salisbury, Prodr. Stirp. Chap. Allerton 16. 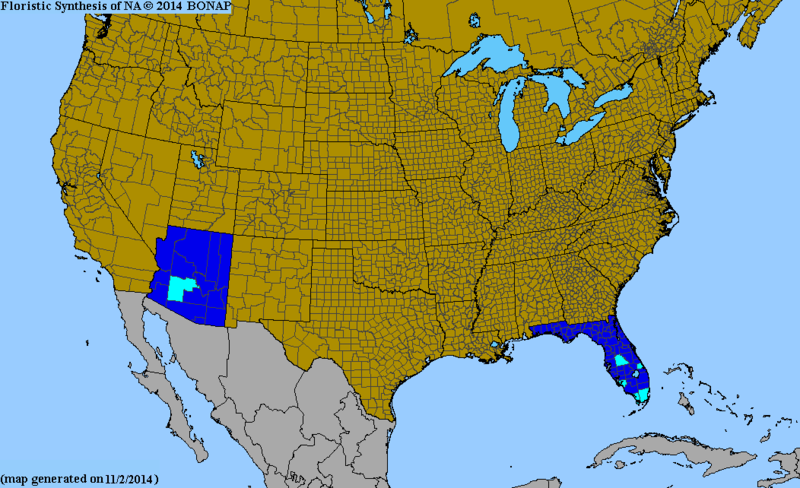 1796, nom. illegit. 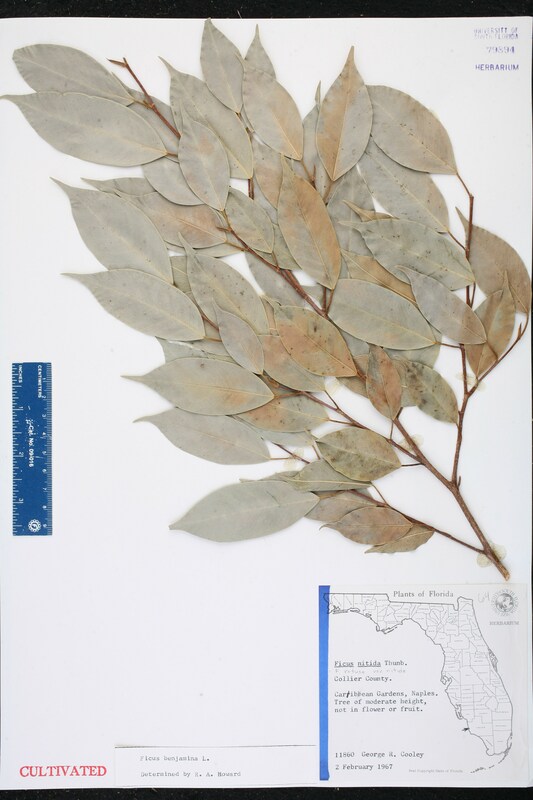 BASIONYM: Ficus benjamina Linnaeus 1767. 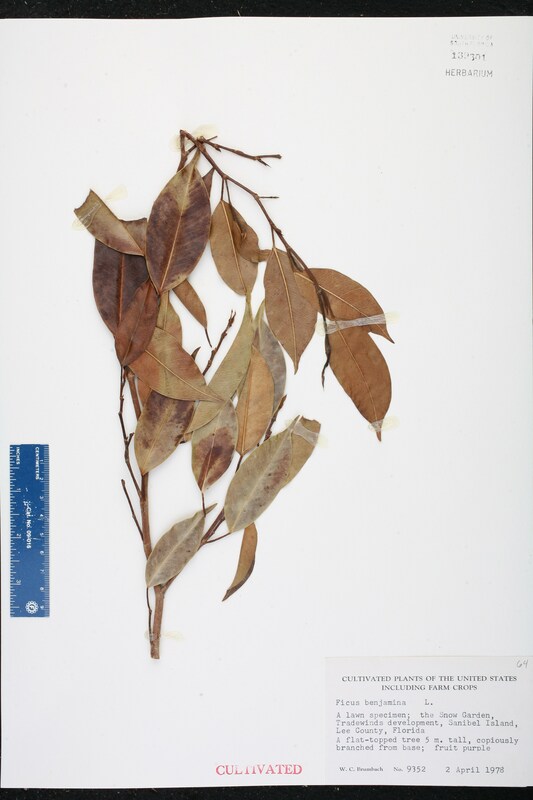 Urostigma benjaminum Urostigma benjaminum (Linnaeus) Miquel, London J. Bot. 6: 583. 1847. 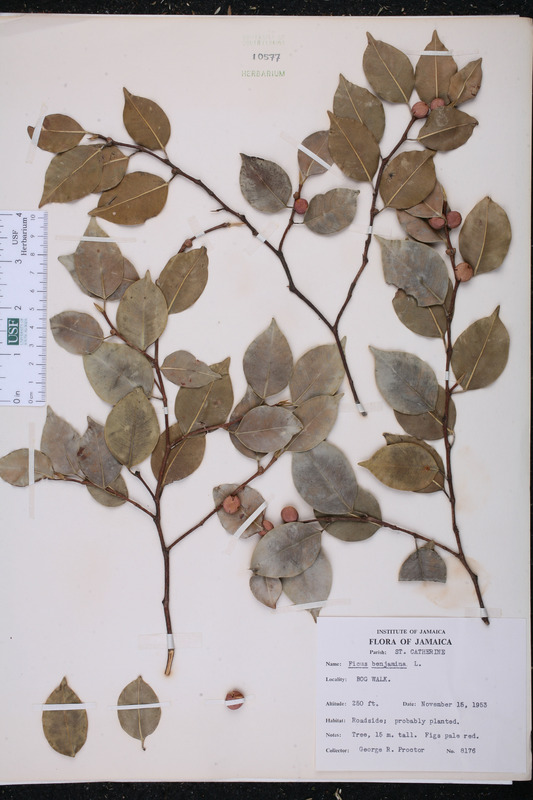 BASIONYM: Ficus benjamina Linnaeus 1767. Ficus nitida Ficus nitida Thunberg, Ficus 5, 10-11, 15. 1786. 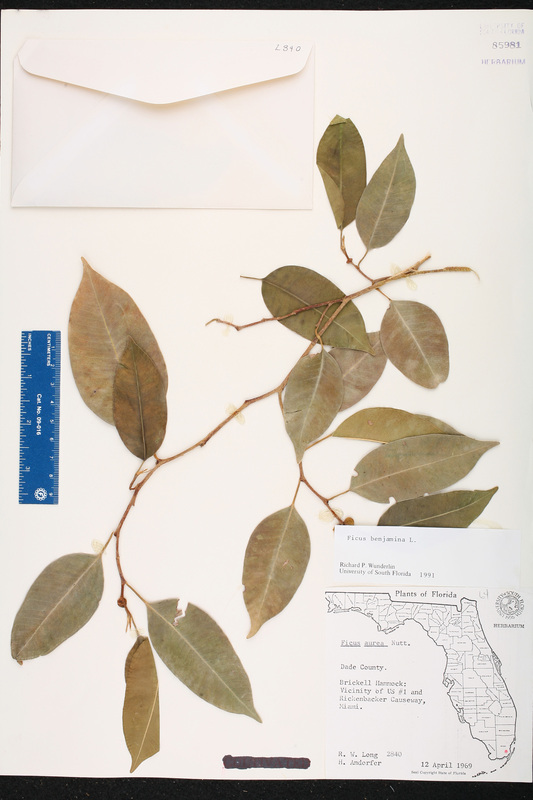 Ficus retusa var. nitida Ficus retusa Linnaeus, var. nitida (Thunberg) Miquel, Ann. Mus. Bot. Lugduno- Batavi 3: 267. 1867. 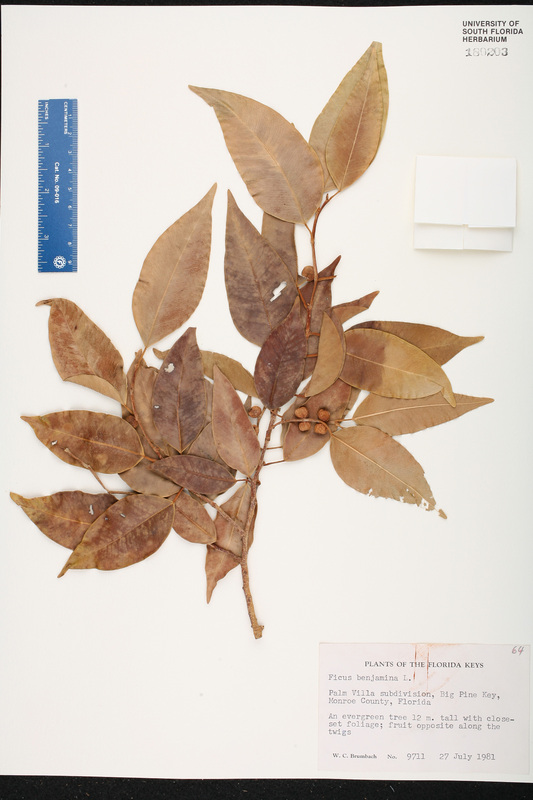 BASIONYM: Ficus nitida Thunberg 1786. Urostigma nitidum Urostigma nitidum (Thunberg) Miquel, London J. Bot. 6: 582. 1847. 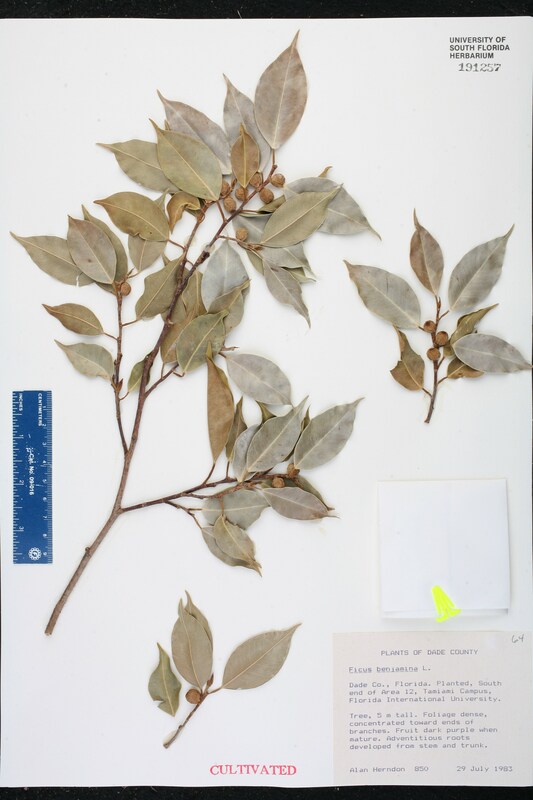 BASIONYM: Ficus nitida Thunberg 1786. USA Florida Lee Co. 02 Apr 1978 W. C. Brumbach 9352 CULTIVATED. USA Florida Monroe Co. 31 Dec 1969 O. K. Lakela 31986 CULTIVATED. USA Florida Collier Co. 02 Feb 1967 G. R. Cooley 11860 CULTIVATED. USA Florida Miami-Dade Co. 29 Jul 1983 A. Herndon 850 CULTIVATED.